LUHANSK, Ukraine - It's been a weird old month here on the front lines of the biggest east-west confrontation since the Cold War. NATO and the Pentagon have repeatedly warned that Russians are not only massing near Ukraine's border, they're ready to strike. As NATO Supreme Allied Commander Europe Philip Breedlove described the Russian buildup: "very, very sizeable and very, very ready." Everyone knows Ukraine's military isn't very, very ready to do anything to stop it. 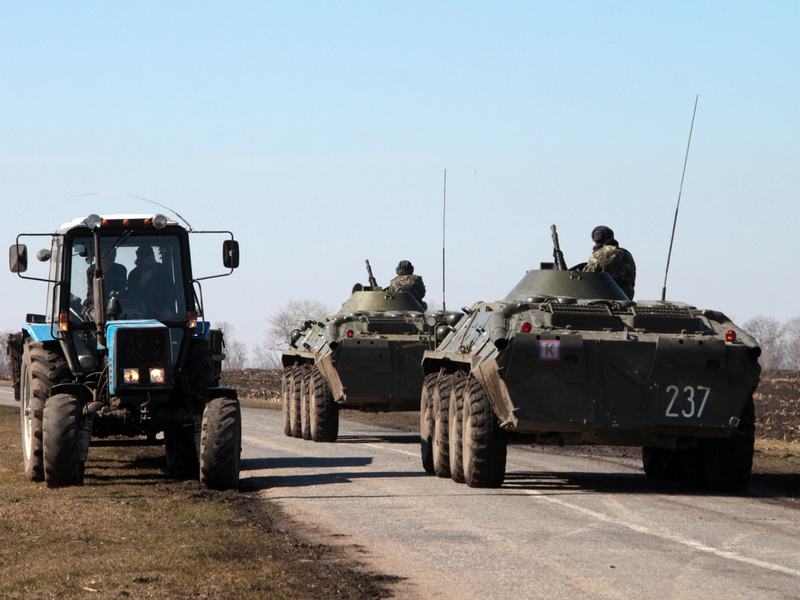 The only sizeable Ukrainian troop movements have been in retreat out of Crimea. Even while getting over the shock (and humiliation) of Russia's brazen land grab, it just doesn't feel like a country on the verge of war. We've been out to the border just northeast of Luhansk, described as a 'beak,' because of the shape of a chunk of Ukraine that juts into Russia, virtually surrounding the land strip on three sides. We came across a few bored border guards, but no military forces to speak of. It shouldn't be much of a surprise that we didn't see any Russian forces over the horizon of the lush open farmland. The military may be breathing down Ukraine's neck, but it doesn't seem like it out there. Villagers we spoke to said they knew about reports of Russian hardware on the other side, but they didn't quite believe it. Living so close to the very porous border, they all have friends and family on the other side. They said they speak to them all the time on the phone, especially now. They said they haven't seen anything. Is Russian President Vladimir Putin getting his way in Ukraine? Yes, of course they're worried. They just don't think Russian tanks are about to start rolling into their village anytime soon. Nobody's leaving. Schoolchildren emptied off a bus while we were there, laughing at the oddity of having an American TV crew in town and saying 'Hello, how are you?' to show off the English they were learning in school. A bit further south we saw where troops had been ordered to dig long lines of trenches along the border, about eight feet deep in places, maybe 10 feet wide, with the displaced earth forming a 10-foot-high berm on the Ukrainian side. It probably wouldn't be much of a defense to slow down the might of a Russian infantry division. But it might make people feel a bit better that at least something was being done. We've seen weeks of pro-Russian demonstrations in Donetsk, but they've petered out in recent days, despite the weather warming up. They've certainly settled down from the kind of demonstrations and counter-demonstrations that ended in the killing of at least two people. The Kiev-appointed governor, Sergei Taruta, told us that pro-Ukrainian demonstrators were told to stay off the streets in order to avoid confrontations with the more aggressive pro-Russian protesters. There's a very good reason for this, aside from trying to maintain public order. The Russians have warned that the military reserves the right to protect Russians who may be under threat. Raging street battles might provide the Russians with exactly the kind of premise used to invade Crimea. But that presents a kind of warped reality on the situation in eastern Ukraine. As careful as we have been, most news coverage gives the impression that most people here want Donetsk to go the way of Crimea. That's not the case. Even some of the protesters are arguing for a referendum that would give this region more autonomy from Kiev - not necessarily to be annexed by Russia. And even though this city may have a majority of Russian speakers, they don't all want to be part of Russia. They're just distrustful and disgusted with the corruption in Kiev. Some truly believe the Russian version of events that the government was brought down by fascists and ultra-nationalists bent on ridding Ukraine of all things Russian, including them. The vast majority of people are just going about their daily business. The downtown area is modern, with plenty of parks and restaurants and rows of luxury brand shops. There is a concern about reports that Moscow may be setting its sites on Moldova, another former Soviet Republic. Marching its military there would mean crossing hundreds of miles of southern Ukrainian territory to do it. The country's broke. Its new government is barely a month old. The army is an embarrassment. While wrangling and economic sanctions and frozen assets and political isolation are battles being waged in places like Washington, Moscow, the Hague and Brussels, about all Ukrainians can do is keep their eyes on the news and on the horizon and wonder what comes next.